The DotConnect Africa (DCA) organization would like to bring an important issue to your attention regarding stories relating to DotAfrica that have been reported in your newspaper by Mr. Remmy Nweke, one of your staff writers. DCA hereby notes with acute concern that this is about the second time that Mr. Remy Nweke has written these types of vexing articles that are obviously titled (with obvious bias) in favour of those who continue to sabotage and oppose DCA’s efforts either by hook or crook on the DotAfrica issue. In the absence of balance and original analyses, it is easy for DCA to dismiss these write-ups as reckless pedestrian efforts, against the backdrop that they fail to draw due attention to the core issues that DCA has raised repeatedly. Such untruthful reportage is not only misleading and confusing to readers and Internet Governance authorities but also displays a certain wanton pedestrianism to the extent that no due diligence had been done by the journalist to indicate whether the mandate for the DotAfrica registry had indeed been given (or not yet given) to Internet Solutions. We expect Mr. Remy Nweke to exercise proper control whilst bridling such reckless instincts that seem designed to favour the opponents of DCA and confuse interested watchers and observers of the DotAfrica domain debate, and how it is shaping up. Moreover, since this story was widely distributed by AllAfrica.com, this well-regarded online news source should have also checked the veracity of the claim made by the Daily Champion newspaper before amplyfying and spreading this piece of falsehood. 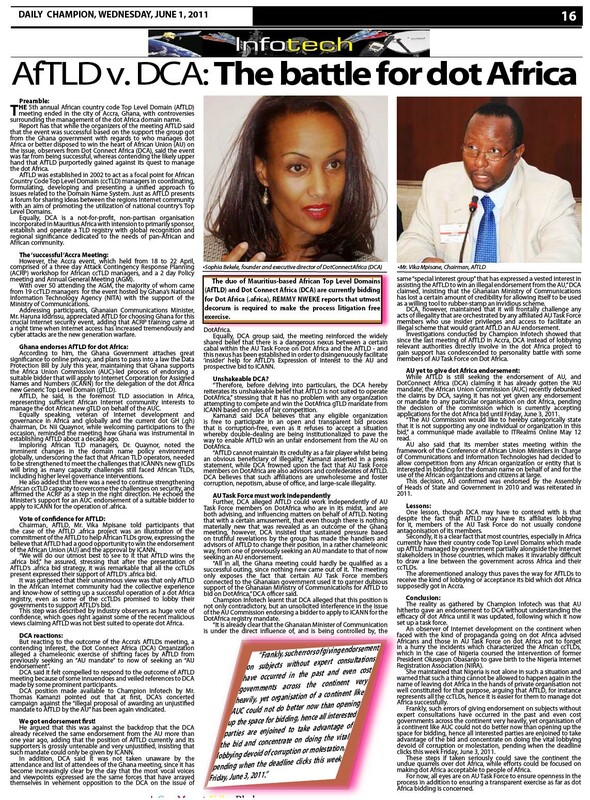 The most recent article (re: ‘AfTLD vs. DCA: the battle for DotAfrica’) published on the Infotech section of Nigeria’s Champion newspaper (Wednesday 1st June 2011 edition, page 16), again reveals the patent strong bias of the writer against DCA. It is well known that DCA has repeatedly exposed all the shameful acts of sabotage, conflicts of interest, illegality, lack of transparency and accountability, to mention just a few unethical activities that DCA believes should have been given due attention, widely condemned, thoroughly investigated by the powers that be and the perpetrators punished; since these negatives reflected the apparent shortcomings of the cabal that has paraded itself as the AU Task Force on DotAfrica, Intead of acknowledging these highly unethical practices, Mr. Nweke’s has chosen to launch an unwarranted diatribe against DCA and blaming it of “condescending to personality battle with some members of the AU Task Force on DotAfrica” or inferring that “the endorsement was given without experts consultations”. dictated by the same people who perhaps informed him that Internet Solutions has won the first choice for the registry operation of DotAfrica. It is important to state for the sake of posterity that DCA followed due process in obtaining the endorsement from the AU in a process that took nearly 18 months or so to accomplish after several rounds of technical presentations, clarifications, analyses and consultations with the AU Commission. Apart from the AU, DCA was endorsed by many important inter-governmental organizations, so how come only the endorsement received from the African Union Commission became controversial. DCA understands that acts of sabotage were committed against it by people on the so-called AU Task Force on DotAfrica, who have also pressured some DCA partners to withdraw their endorsements. This is commonly known to all those who have been following the DotAfrica issue on every continent of the globe. Accordingly, DCA is somewhat mystified that Mr. Remmy Nweke has failed to highlight and elucidate these issues, as an important duty in the service of responsible and ethical journalism. If Mr. Remmy Nweke believes “that utmost decorum is required to make the process litigation free exercise”, then DCA expects that this same journalist should be holding the AU Task Force members to publicly account for their actions which so far, fall short of proper decorum. Thus, DCA reasonably believes that it has been acting within its rights by exposing acts of victimization and willful sabotage that have committed against it by certain vested interests. DCA therefore requests the Editor-in-Chief of the ‘Daily Champion’ to quickly address this legitimate concern of ours to ensure that DCA does not continue to suffer from this type of unethical journalism that is being inflicted upon it by Mr. Remmy Nweke. If this reputability attack and malicious victimization does not cease immediately, DCA might seek an alternative form of redress, not excluding legal mechanisms, to protect itself from being libeled. Journalism’s ultimate purpose is to inform the reader, to bring him each day a letter from home and never to permit the serving of special interests.